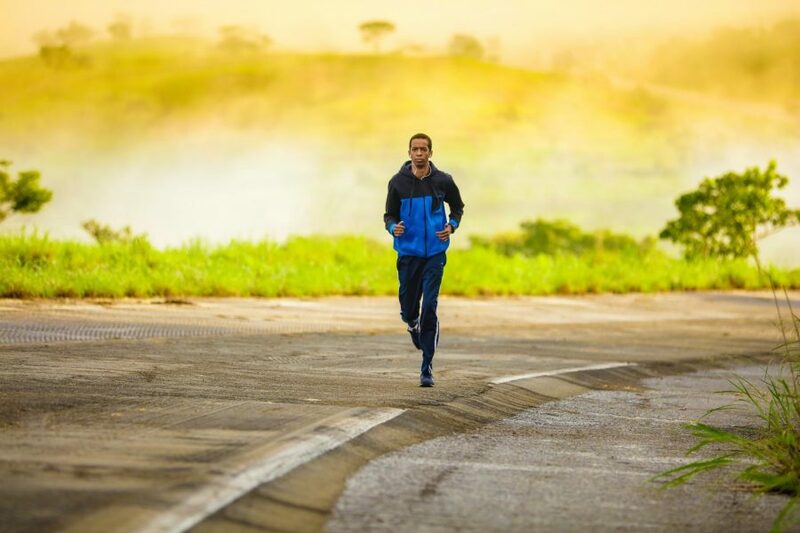 Listening to podcasts when you’re out and about can be an enjoyable, enlightening, and efficient use of time, but sometimes — when you are exercising, say — you want to leave your iPhone behind. In the past, you might have solved the problem by loading podcasts on one of Apple’s tiny iPods, but non-iOS iPods are no longer readily available (see “Apple Discontinues the iPod nano and iPod shuffle,” 31 July 2017). What about that Apple Watch on your wrist? Apple provides no way to move podcasts from iPhone to Apple Watch, but a handful of third-party apps do offer this functionality. I have been testing five such apps and — spoiler — I’m not ecstatic about them. They all have rough edges and varying degrees of glitchiness. But they do what they claim: turn an Apple Watch into a modern-day iPod (at least for podcasts) by copying the audio files from the iPhone to the watch. Link AirPods or other Bluetooth audio devices to your Apple Watch, and you are good to go. Each app has its own approach — with pros and cons — for achieving this watch-as-iPod feat, so there is something here for everybody. Outcast ($0.99) is a rarity: a full-featured, phone-like app distilled onto the tiny Apple Watch screen. 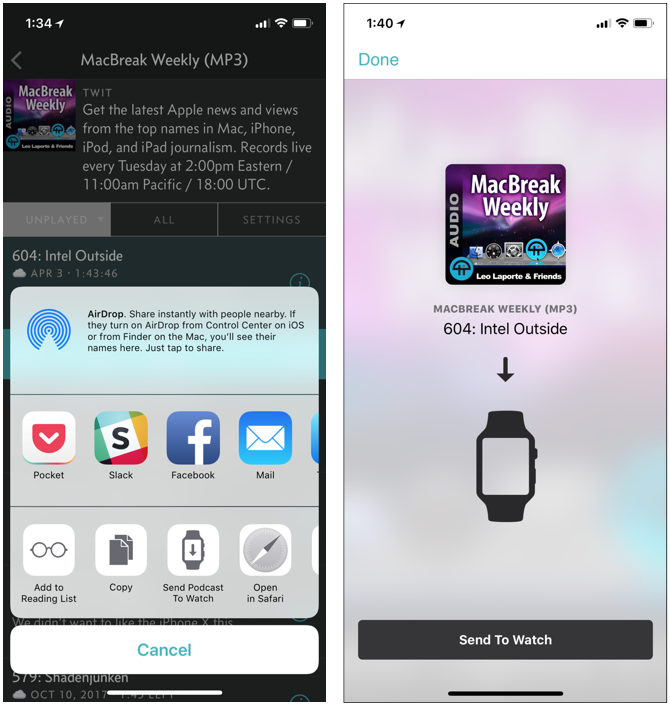 Although it must exist as an iOS app to also provide a watchOS app, Outcast focuses on the Apple Watch and provides little corresponding iPhone functionality. 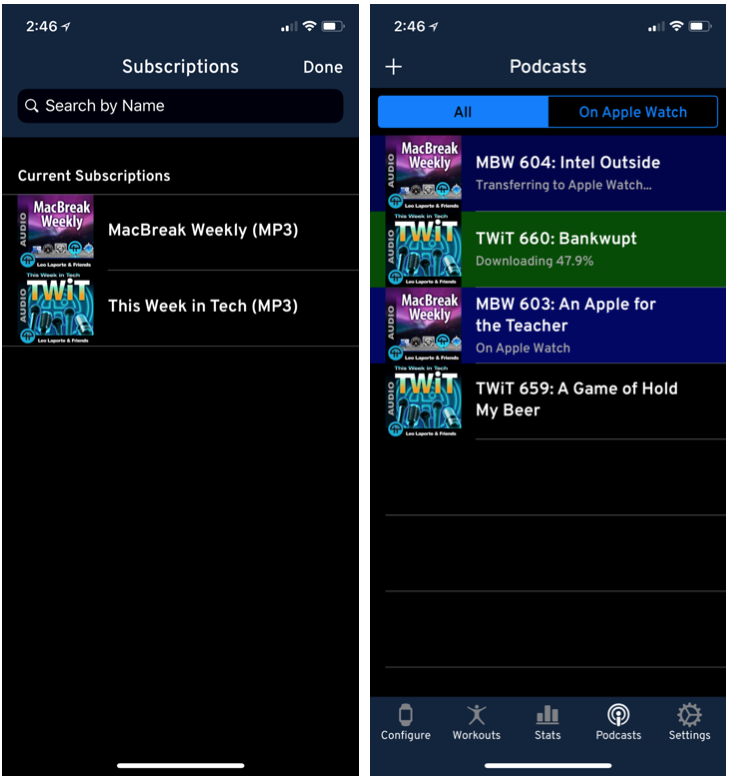 To get started with Outcast, you first tell it what podcasts you like, either by entering a podcast’s feed URL into the iPhone app or browsing the app’s directory of podcasts on the watch by network (such as Relay FM) or topic (such as “technology”). There are lots of topics listed but only a handful of networks shown, so app maker Crunchy Bagel has work to do there. Alternatively, if you’ve already subscribed to podcasts in certain iOS podcast apps, like Pocket Casts or Overcast, you can migrate those subscriptions to Outcast. This is accomplished by exporting your podcast list from your iOS podcatcher in OPML format. When you do so, you are prompted to pick the destination; select Outcast, and your podcasts are installed on your watch. Apple’s iOS Podcasts app does not have an OPML-exporting option. All your podcasts appear on the Apple Watch in a scrollable menu. Tap one, select an episode, and tap a download button beside it to pull it down using Wi-Fi — or, in the case of certain Apple Watch Series 3 watches, cellular LTE. Downloaded episodes appear in their own little menu. Tap one for a full set of playback controls. When you finish with that episode, click the trash button to purge it and free up precious space on your Apple Watch. I’d like to sing Outcast’s praises unreservedly, but it suffers from too much funky behavior. I experienced slow or stalled downloads, playback hiccups, and missing album art. Regardless, Outcast is an impressive feat of Apple Watch app development, and I like it enough to keep using it on occasion. MiniCast (free) is at the opposite end of the complexity scale, functioning as little more than a transfer tool to help you move episodes from iPhone to Apple Watch for playback on your wrist. At this point, an animated full-screen alert on the phone prompts you to tap a Send To Watch button. You’ll see a listing for the episode appear on your watch, but you’ll need to tap it and then tap a download button to complete the file transfer. At that point, you’re ready to play the episode. MiniCast works reasonably well, but the file transfers were slow enough to cause me toe-tapping impatience. At least the app alerts you when the download is done. Transfer speed tends to be an issue with all the apps I tested, which might be a dealbreaker for those who don’t like to schedule time for pre-workout setup. Playback in MiniCast works as expected. A force touch reveals delete and scrub options. MiniCast’s creator smartly concluded that podcast addicts would want to stick with their favorite iOS podcatchers, and offered a podcast transfer capability that works reliably (if sometimes slowly) within any such iPhone app. The main problem I hit is that episode playback doesn’t stay synced between the iPhone and Apple Watch, since you’re using entirely different apps on each. Podface (free) is a simple iPhone podcatcher that can also transfer episodes to your Apple Watch. As a bonus, it has a workout-related flourish. 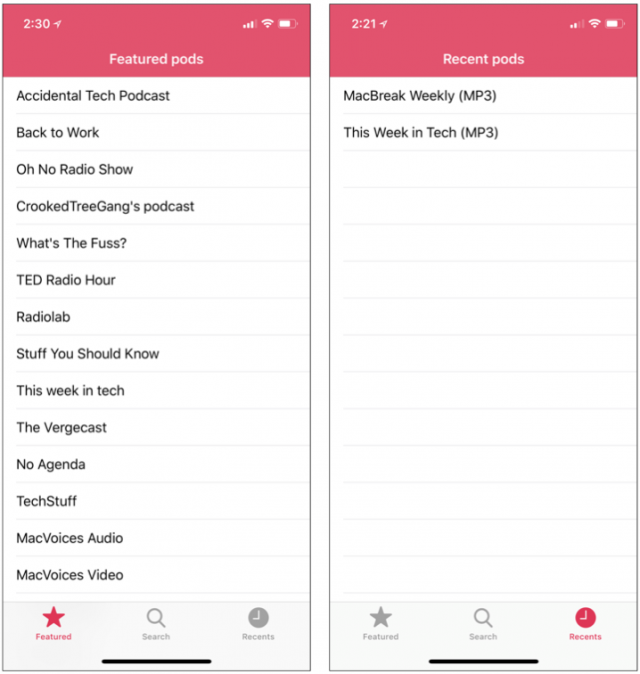 To start using Podface, you must enter keywords to search for your favorite podcasts or look for shows you might like (it doesn’t offer a browsable podcast directory). Once you’ve found the show you want, click the microphone icon next to it, and recent episodes appear. You have two options with each episode: play it on the iPhone by tapping a speaker icon, or migrate it to your Apple Watch by tapping the watch icon. The latter function starts once you confirm the transfer on the Apple Watch. In a nice touch, Podface provides a watch complication that morphs from a microphone icon to a progress circle for at-a-glance monitoring of current downloads. Once the episode is on your Apple Watch, you select and play it as you’d expect, and as with MiniCast, you can force-touch the playback screen to skip around in the episode and delete it. The Podface iPhone app is useful in other ways. Its Featured screen shows suggested podcasts based on your usage. 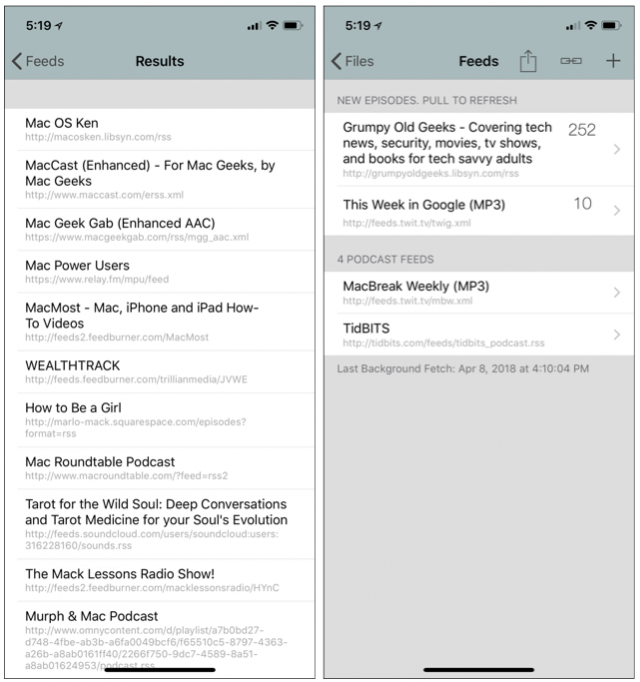 And the Recents screen lets you track which podcasts you have accessed. For those who listen to podcasts while exercising, Podface has a basic fitness feature: it begins tracking your physical activity when you hit play on a podcast (there is no option to disable this, that I can see). Then, when you tap End Workout, the app shows you elapsed workout time and how many kilocalories you have burned. That’s it. You can opt via a toggle whether or not to save workouts. Podface works reasonably well, but sits in a weird place, being neither a full podcast app nor a full fitness app. As a result, it’s unsatisfying. If you like Podface’s approach but have no interest in its fitness feature, another app called WatchPlayer ($0.99) provides roughly comparable functionality and adds a trick or two of its own. Like Podface, WatchPlayer lets you use keyword searches to find podcasts you know or might like. Tap a search result and it’s added to your Feeds screen. Tap it again and you get an episode list. Tapping an episode starts a download but not a transfer to the Apple Watch. Switch to a Files screen to transfer episodes to the Apple Watch — I managed to get episodes onto the Apple Watch, and to play them, though not without difficulty. I got a number of “Session could not be started between iPhone and Apple Watch” error messages. The iOS interface often froze on me, as well, making WatchPlayer by far the most frustrating app I tested. In addition to a Send to Apple Watch option, WatchPlayer offers a Download with Apple Watch option. This latter choice seems to be a way of downloading episodes directly from the Internet onto the watch, but my attempts to do so went nowhere. Finally, WatchPlayer has a Send Feeds to Apple Watch option that seems to be a way to create a menu of subscribed podcasts, but the Feeds screen on my watch remained stubbornly blank no matter how many times I tried a feeds transfer (see below). WatchPlayer has another unique feature — a second audio-control screen on the watch that, instead of starting playback of an episode on the wrist gizmo, does so on the iPhone, which makes the app a remote control of sorts. This worked perfectly for me. Although WatchPlayer is similar in design to Podface, and has a few clever touches of its own, it’s nevertheless one app I cannot currently recommend based on its off-the-charts malfunctions compared to its competitors. Perhaps it will improve in an update. I had previously never used the free Workouts++ (I’m more of a Strava, Zwift, and Apple Workout guy), but the app seems like a terrific exercise-tracking tool for iPhone- and Apple Watch-equipped fitness enthusiasts. As a bonus, it has podcast features. Getting started with podcasts is similar to Podface and WatchPlayer. 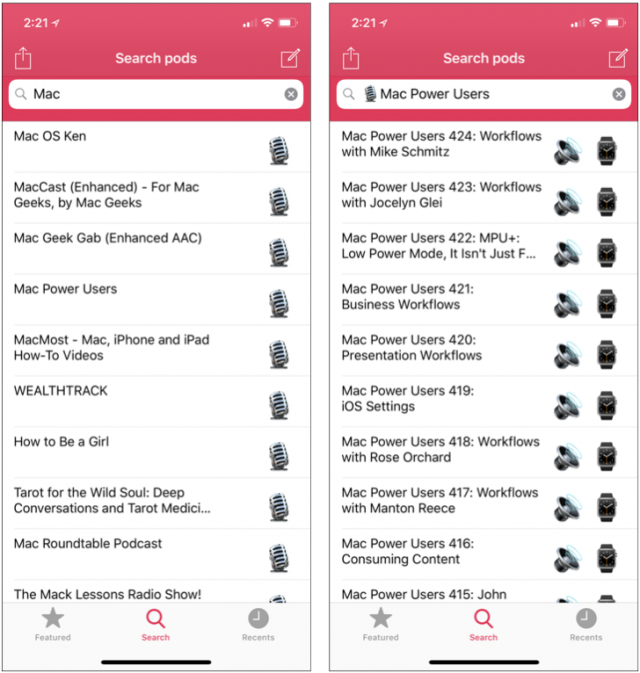 Click a + button in the upper-left corner, and Workouts++ prompts you to search for a podcast using keywords. Shows you select get added to the Subscriptions screen. Recent episodes are shown on a separate Podcasts screen. Tap an episode and a watch transfer starts. When playing a podcast on your watch, you can regulate playback speed and jump to a particular point in an episode via a timestamp in the Seek To screen. Remember, Workouts++ is primarily a workout app, so it will not even let you play a podcast until you start a workout. The audio-playback interface is one of several screens for the exercise session, and it isn’t accessible otherwise. Sneaky! But like it. I may even give Workouts++ a whirl to see if it might become my new workout buddy, with the podcast capability as a nice bonus. I enjoyed using all of these apps, and Outcast and Workouts++ in particular. I liked being able to transfer podcast files to my Apple Watch so I could leave my iPhone behind while on bike rides and power walks. But none of these apps is sufficiently dependable, polished, or full-featured to make me consider ditching Pocket Casts or Overcast, which I have used interchangeably over the years. Outcast, as a full-bore podcatcher on the Apple Watch, comes the closest. It would be great if a top iOS podcast app offered an option to move podcasts episodes to the Apple Watch. 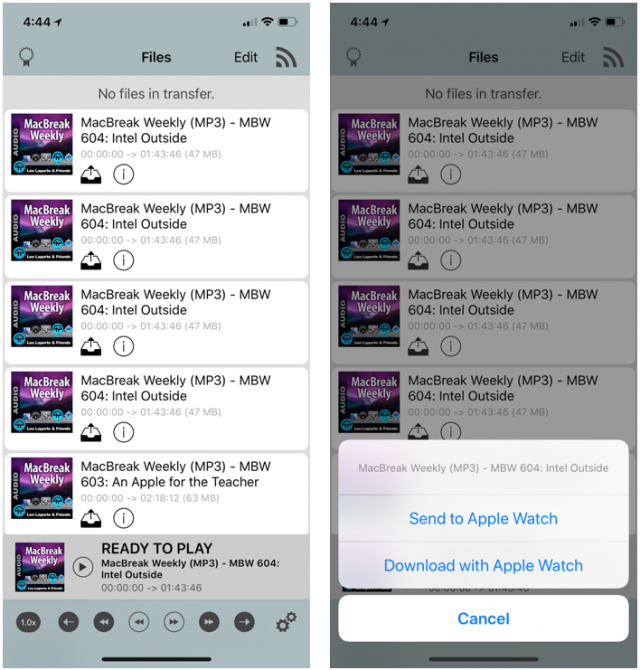 In fact, Overcast provided such a feature until recently, but developer Marco Arment removed it, explaining in a blog post that watchOS 4 has too many limitations to make an Apple Watch podcast app deliver the quality and functionality that users expect. At the moment, he believes that standalone podcast playback on the Apple Watch isn’t ready for prime time. Based on my experiences while testing these apps, I can’t disagree. Thanks for the breakdown! I returned my apple watch back in nov due to the terrible podcast support (plus the bugs that were out of the gate on release). Been contemplating getting it again but looks like there is still a podcast problem. Hey, that’s when I bought my watch! Thank you, sir, I’ll take a look. Before clicking Buy, I thought I’d check the reviews. Though you mention some challenges using these apps, I was astonished by the poor App Store reviews, which range from 2-star to 4-star (with many reporting bad experiences). In fact, Stephen’s recommendation, iCatcher!, has the best reviews of any of these. App Store reviews are of limited value, but they sure make it seems like none of these apps is ready for prime time. I would take these reviews with a large grain of salt. The Apple watch is extremely limited in what it can do, and I expect that many of these reviews are based on not getting a wonderful iOS experience on their 38mm screens. Try them out. Even if they cost money, if you find them not useful, request a refund. It’s pretty much automatic at this point. Thanks for the tip. I didn’t know it was so easy to get a refund. I agree with your point and I’m skeptical of the reviews overall. I should have plugged them into FakeSpot but too lazy. It was startling to see 2-star reviews for some of them. Meanwhile I’ve tried Outcast (which it turns out is from the developer of Streaks.app which I use) and MiniCast. So far, so good. I’d give the nod to Outcast, which is only $1 compared with $4 for MiniCast. I thought I’d like MiniCast since you just transfer one episode at a time, but Outcast delivers a prettier experience and more functionality for less.